Here is an easy-to-build project that demonstrates how like electrical charges repel. The electroscope was developed by English physicist William Gilbert in 1600. I remember playing with one in physics class in junior high school (one of the few classes that interested me at the time). The electroscope in the article calls for the use of gold leaf, but it can be any type of good electrical conductor. In fact, I found a video (below) on YouTube that shows how to make an electroscope out of commonly available materials. This would make a good conversation piece to sit on your desk. Early experimenters used this device to detect presence of electricity and static charges. 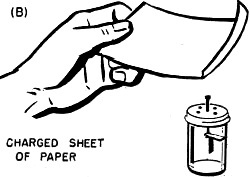 These four drawings illustrate basic experiments that may be performed with the simple electroscope. Many others may be carried out with this device. See text for suggestions. The electroscope is one of the oldest electrical instruments. William Gilbert built one in the year 1600. Nevertheless, it is still a useful device. It is easy to build, and many interesting experiments can be performed with it. An electroscope consists simply of a small strip of gold leaf, one end of which is attached to a metal plate of about the same size. The leaf hangs parallel to the plate and may even rest against it. 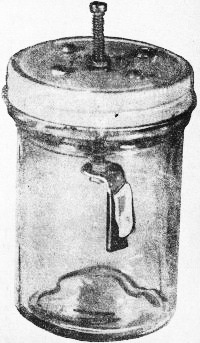 This assembly is then attached to a metal rod and enclosed in a glass jar. It can be seen from the outside but will be protected from drafts of air. The metal rod protrudes and permits external connections. Ordinarily, the leaf hangs close to the plate or in contact with it. But when an electrically charged body is brought close to the rod, the leaf stands out, away from the plate. The distance it moves depends upon how strong the voltage of the charged object happens to be. The leaf remains lifted as long as the charged object is kept in position, or as long as the object remains charged. It may remain lifted even after the body is removed, if the electroscope has been charged. When the electroscope is discharged, by "shorting" it momentarily to the earth, the leaf will fall. This action occurs because the electrified body charges the metal plate and the gold leaf by induction. Since the leaf and the plate are attached together, they receive the same sort of charge, i.e., positive or negative. And since a basic law of electricity is that like charges repel each other, the light gold leaf is repelled by the plate. One of the simplest measuring instruments may be easily constructed in a few minutes. The electroscope consumes no current while indicating the presence of electrons. Furthermore, it requires only one connection to a circuit, and often no direct connection at all. Building an electroscope requires a small glass jar, a small strip of gold leaf, and a few odds and ends from the junk box. Figure 1 shows details of construction. Make a small metal bracket, as shown in Fig. 1C. Any convenient non-magnetic metal such as aluminum, brass, or phosphor bronze will be satisfactory. To make the bracket, cut a 1 1/8" x 3/8" strip. Drill a clearance hole for a 6-32 bolt (# 28 drill) 3/16" from one end and 3/16" from the side of the strip. Finally, make a right-angle bend to form the bracket. The next step is to cut a 5/8" -diameter clearance hole in the center of the metal jar top. (See Figs. 1A and 1B). There is no objection to making this hole larger, but it should not be smaller than 5/8". To cut the hole, the author used a radio socket punch. If a plastic jar top is used, the hole will not be required. 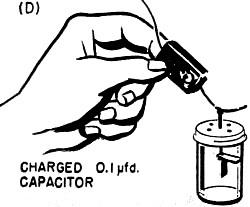 The pickup electrode of the electroscope consists of a 2" -long 6-32 bolt, and the purpose of the clearance hole is to insulate the bolt from the metal jar top. 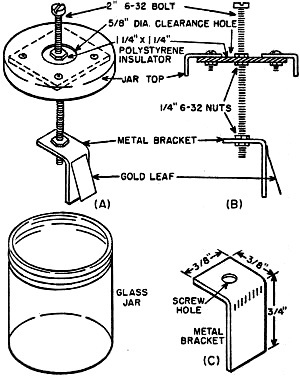 This bolt is supported by a small square of polystyrene (1 1/4" square) fastened to the inside of the jar top with four small 3-40 bolts and nuts, as shown in Figs. 1A and 1B. A clearance hole (#28 drill) in the center of this square passes the 6-32 bolt. Assemble the electrode bolt, insulating plate, and metal bracket on the jar top. Tighten all of the nuts securely. After assembly, polish the long surface of the bracket with fine sandpaper until it is bright. Then scrub the surface with soap and hot water to remove all dirt and grease. Wash off the soap, rinse the bracket several times in clear water, and dry thoroughly. From this point on, do not touch the bracket with the fingers; do not allow it to come into contact with any oil or grease; and do not breathe on it. The reason for this cleanliness is that the gold leaf, which will be attached next, will stick to the bracket if the latter is the least bit dirty, and the electroscope will not work. Fig. 1. 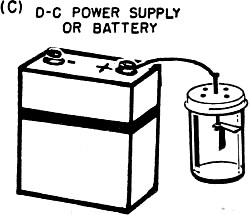 In assembling the electroscope, the author used an empty peanut jar. The cardboard insert in the lid is removed and a hole is cut in the center of the metal lid. A small square of polystyrene is then mounted under this hole and a 2"-long bolt fastened through the center. At one end. mount the metal angle bracket shown in (C). Glue the gold leaf to the bracket just beyond the bend as shown in (A) and (B). Now attach the gold leaf. Gold leaf is exceedingly light and thin and must be handled in a draft-free room. During this operation, close the windows and doors and tie a handkerchief or mask around nose and mouth to prevent blowing the leaf out of shape. Gold leaf comes in a book of sheets with separating pages of tissue paper. It can be bought from a sign painters' supply house. Pull out a leaf with a tissue page on each side and lay this "sandwich" on a sheet of flat cardboard. Then, with a sharp razor blade or Exacto knife, cut through the tissue paper and gold leaf to obtain a strip 3/4," long and 3/8" wide. With a clean wooden toothpick, remove the top layer of tissue paper, exposing the gold leaf. Then, spread a thin strip of Duco cement (about 1/16" wide) along the upper bend of the bracket; this area is shown by the shading lines in Fig. 1C. Before the cement has chance to dry, lift the assembly by the jar top and quickly press the cemented edge of the bracket against the tip of the gold leaf strip. This procedure will attach the leaf to the bracket. Screw the top on the jar, and the electroscope is completed. When the jar rests on its bottom, the gold leaf should hang against the bracket. As the jar is tilted, the leaf should swing away from the bracket. If it sticks to the bracket, the latter has not been thoroughly cleaned, and must be cleaned again. An electroscope indicates the presence of an electric charge just as a magnetic needle will show the presence of a magnetic field. When the electrode of the electroscope is touched to an electrically charged object (or, in some cases, simply brought near it), the gold leaf will move away from the metal bracket. High voltages will swing the leaf over the greatest distances. 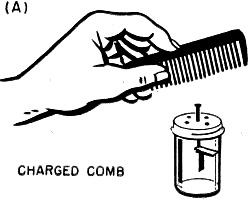 Try combing the hair briskly and then bringing the charged comb near the pick­up screw. See how the gold leaf rises to show the presence of static electricity. A glass rod rubbed with a silk cloth will give the same effect. Static electricity can also be generated by laying a dry sheet of typewriter paper on a highly polished desk or table, or on the cover of a magazine having a glazed surface (like POPULAR ELECTRONICS), and rubbing the paper vigorously with a wooden pencil. When the paper is lifted, it will be highly charged; and when brought to the electroscope, it will deflect the gold leaf. Shuffling feet across a rug, and then touching the pickup screw with a finger will result in a high voltage swing of the leaf. A hairy brush or broom after stroking a floor or polished table top likewise acquires a considerable charge of electricity. In some localities, however, it is hard to generate static electricity in any of the ways just described unless the weather is cool and dry. Humid days often tend to ruin the experiments. When the electroscope pickup is touched to one terminal of a power supply or high voltage battery, the leaf will be deflected. Three hundred volts d.c. will move the size of leaf shown in this article through 45°. Similar leaf movement is obtained when the screw is touched to one terminal of a charged capacitor. Electroscopes sometimes are used in industry to detect static charges on paper, photographic film, cloth, plastic sheets, machinery belts, etc. They have been used in surgical operating rooms and around oil trucks for the same purpose. A "hot" piece of radioactive ore has been observed to discharge a previously charged electroscope. 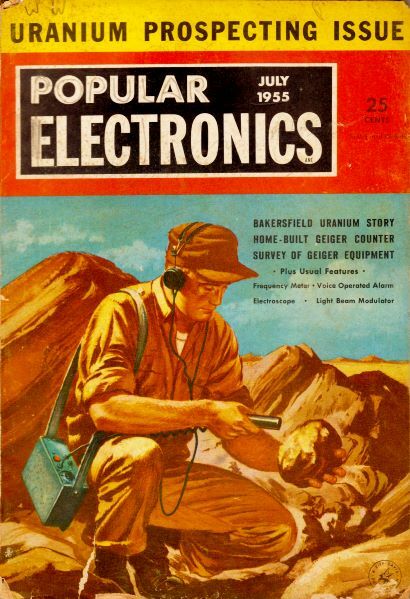 However, don't expect to take this instrument on a prospecting trip in place of the more expensive Geiger counter. It just is not sensitive enough or rugged enough for such an application.